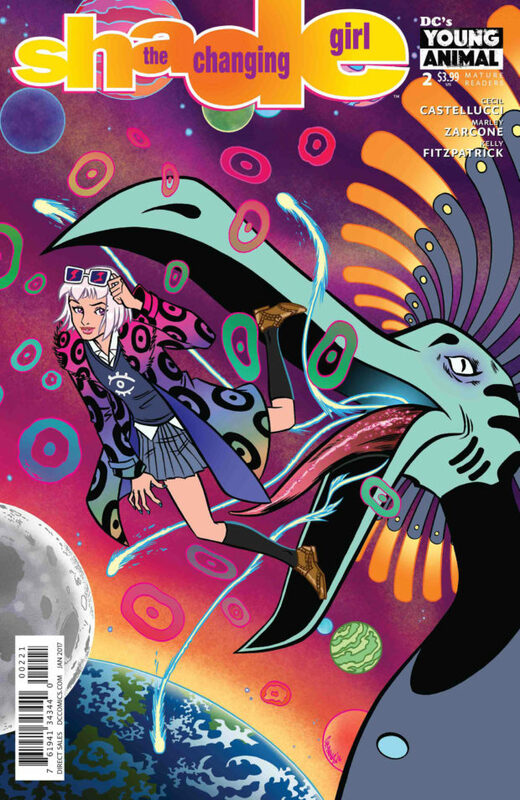 Graphic Novel Review 26/365: Shade The Changing Girl – Pull List Week! In 2016, DC Comics, in conjunction with musician/artist Gerard Way, launched a line of comics for mature readers: DC’s Young Animal. The line consists of four titles: Shade The Changing Girl; Doom Patrol; Mother Panic; and Cave Carson Has a Cybernetic Eye. I have not read all of these titles, but what I have read has been strange. A good or bad strange you ask? 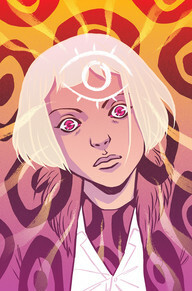 I don’t know yet…but I do know that today I will review Shade The Changing Girl. Here’s the deal: alien bird-person (Avian) Loma Shade has stolen a Madness Vest and has transferred into the body of a 16-year-old teenage girl from Earth named Megan Boyer. Megan has been in a coma, and her family had given up hope of her waking; however, she wakes, with a new alien mind that has taken over her body and life with not much of Megan left to navigate alongside Loma Shade. Loma is obsessed with a writer and television show, which plays a part in the story, and the alien home-planet is looking for the stolen Madness Vest which is in the possession of one of Loma’s friends, along with her body…soooo yeah, that’s the basic starting premise of Shade The Changing Girl. Shade is by far the strangest book that I’ve reviewed thus far. I like strange, so I’m in! But it took me two-three issues to submerge myself into the story. After issue one, I can see people putting it down, thinking that it might be a bit too strange for them. If this was a film, the first fifteen minutes would have had my mom whispering “What’s going on?” about ten times, but it levels out as it goes on, and gaps begin to get filled, and my mom would be eating popcorn…confused. But I like interesting, different concepts, and I’m willing to bet a lot of you do as well. This Young Animal line will not disappoint on the weird front! I want to give a shout out to writer Cecil Castellucci! I’m a fan of Cecil’s work; I don’t think I’ve ever read anything by her that I didn’t dig. I will be reviewing a few of her books during this run of 365 reviews! And I was actually lucky enough to be on a comics panel with Cecil a couple of years ago at San Diego, and she was super cool. So cool in fact that she agreed to be interviewed by one of my students for a project. You can read that review from one of my past blogs here. If you dig strange concept stories, check out the the Young Animal run over at DC Comics, and make sure you tell your favorite authors and artists that you appreciate them!